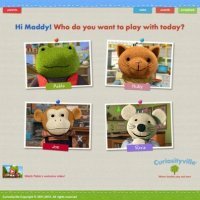 This subscription-based website invites kids to explore the city of Curiosityville by playing with its charming residents made up of animated animals, including Artist Pablo the frog, Teacher Ruby the cat, Mayor Joe the monkey, and Scientist Rosie the mouse. Great learning destination for kids ages 3 to 8. Try the first month for free. This subscription-based website invites kids to explore the city of Curiosityville by playing with its charming residents made up of animated animals, including Artist Pablo the frog, Teacher Ruby the cat, Mayor Joe the monkey, and Scientist Rosie the mouse. Additional residents, including Policeman Jack the dog, are set to be released shortly. By playing games and doing activities with these characters, kids can explore 10 core learning areas. The learning areas cover traditional skills, such as science, math, social studies, and language arts; but they also teach skills, such as creative expression, executive function, technology, social and emotional development, physical and healthy development, and ones dubbed as "21st Century Skills," which include creative thinking, analyzing data, reasoning, and working collaboratively. When your child selects a character, he or she arrives at that character's home or workplace. Since Rosie is a scientist, kids play within her lab. Objects that lead to games will sparkle, so kids know where to click in the room. If they click on the sparkling microscope, that starts a game about identifying magnified objects that appear on slides. Kids will investigate pond water, dust, blood, insects and pollen. With Mayor Joe, kids join him in his home to explore his hobbies. He likes music, exercise, playing games, and making things. The latter interest turns into a fun slider puzzle where kids rearrange panels to create a picture. For music, kids are provided with a simple sound board where they can experiment with creating their own music. They can add in sounds from cows, pigs, and even a police siren. Curiosityville is reasonably priced at $7.95/month; and it offers a free trial for a month. A membership allows families to log in up to four different children. This virtual world is well worth exploring because it is filled with refreshingly different learning games. Based on early learning and brain science research, the games don't talk down to kids and take care to present real world experiences. For example, Scientist Rosie has real life scientists come to visit her classroom via short videos. Also, when playing a game about emotions, kids will sort facial masks that are based on real world tribal masks. Another great feature is that the site personalizes the learning based on your child's age. If your child is 3 or 4, she will start with level 1 of a game. Kids ages 5 or 6 enter at level 2, and those 7 or 8 at level 3. The learning engine working in the background takes into account your child's accuracy and the amount of time required to answer a question in order to adjust the content. While helpful, the automatic adjustment doesn't always work quite right when kids are struggling. When kids play in this virtual world they earn both points toward badges and apples. Collecting apples leads to a unique activity about donating them to charitable causes. Curiosityville is currently partnering with Ultimate Block Party, DonorsChoice, and the Association of Children's Museums; and when kids donate their apples to one of these three organizations, Curiosityville makes an actual monetary donations to the organization of the child's choice. Parents will appreciate the robust feedback features built into this learning site. They can get information about what activities their children did, the amount of time played, and the core skills practiced. The information can be obtained on the site or via an email sent to the parent. In addition, Curiosityville makes recommendations for both offline and online activities to further your child's learning. As good as Curiosityville is -- and it is quite good -- it could improve a few of its features. It is missing audio for some of its activities, and thus non-readers are at a disadvantage. Without audio within some of its activities or for directions, the site periodically misses learning opportunities. For example, in the activity about finding objects under the microscope, kids can't click on an item to discover what it is. Founder Susan Magsamen says that adding more audio "is a top priority" and that it is coming soon. Another feature that could use some tweaking is navigation. For the youngest children using this service, parents might want to be around to help when they first start. I would also like introductory sequences to be interruptible after hearing it the first time. As with all online learning environments, this exciting virtual world is a work in progress. New characters and more learning activities are being added on a regular basis. But as it stands now, it's a great learning destination for kids ages 3 to 8, particularly with its free first month offer.